I had last Tuesday off, and we went to IKEA- with the purpose and intent of getting some picture frames. While rolling around on my mother-in-law's backyard lawn the other day, Jackie, Hazel and I had some really nice pictures taken on Grandma's iPhone. After price shopping, Jackie had them printed in 8x10 format at Costco (very cheap rates!). 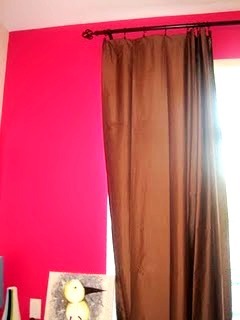 We picked them up, and decided to hang them linear along the right side of our living room's pink wall. And the quest for picture frames (specifically white ones) set us out to IKEA on an adventure. About an hour (and a stomach full of Swedish meatballs) later, we found ourselves in the framing department and couldn't find a single frame to fit our size of pictures. They had 8 x 11s, but no 8 x 10s.... and what do you do with that extra 1" of space? It wasn't something I was in the mode for DIYing..I just wanted to buy the frame, insert the pictures, and hang. But, it became abundantly clear that we were going to have to pursue a different venue. 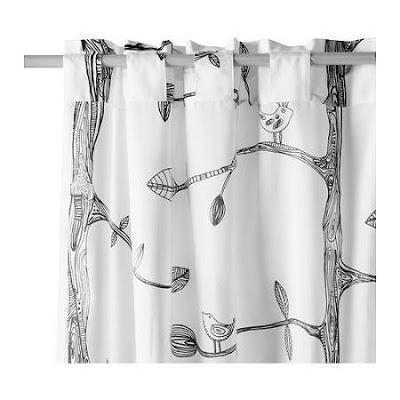 They were billowing on display, and had this amazing print of trees and birds, and looked like they were drawn on with a sharpie! They just seemed to suit us so well. We barely even discussed whether or not we should buy them. I literally grabbed a pair, and threw them into the cart and said "we need these". And at $19.99 a pair, who could resist? As chronicled over here, we already had endured a curtain dilemma with whether or not we should keep the silky chocolate brown ones... As you guessed, we did, and they've done a pretty decent job of keeping our apartment cool through the occasional summertime heat wave. 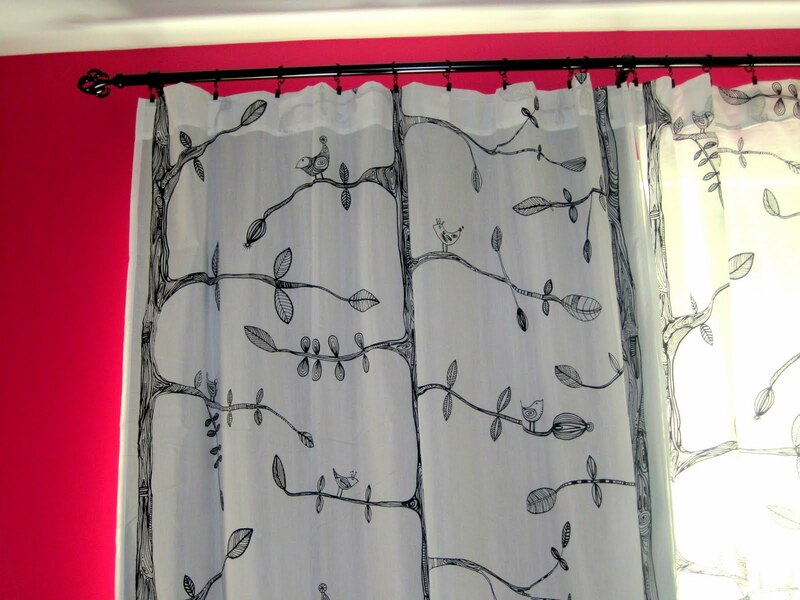 But, whenever I sit in our living room, I can't help but feel that these curtains look out of place. Sometimes I simply feel that they just don't suit us. Other times, I think that if we were to paint the wall a different color (blue or green) that the curtains would look smashing... but a mid-tone brown on a vibrant hot pink just doesn't sit well with me (and heaven forbid we should ever paint over that luscious shade of pink!). It looks okay- but that's the problem- I don't ever want anything in my home to look just okay. that I've lost the receipt since then. Jackie volunteered to hang the new ones. 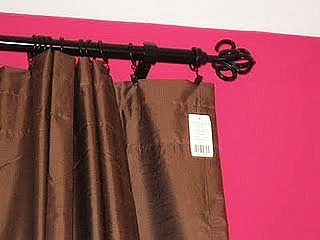 We discussed keeping the brown ones up, and buying a second rod to hang the new ones with, and have the brown ones overlap over the new curtains. While balancing up 7 feet off the ground, and with Hazel trying to climb up the ladder behind her, Jackie took a brown panel down, and replaced it with a white one. The difference was remarkable between how much light the white one let in. Jackie also noted that the heat was pouring in since having removed the brown one. 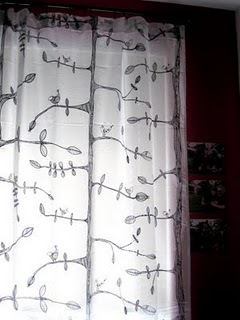 We tried a second option: putting the new white curtains over top of the brown ones. That way, it would give better light control and we could show off the new white ones. but with LOTS of light pouring in! Once everything was up and in place, I sheepishly noted that with the small theme of "birds and trees" that we had going on in our living room, the new white curtains were a shoe in! Well, a set of curtain panels and a 2012 IKEA catalogue later (yeah, I stole one.. but as karma would have it, the cover was all sticky and gross, so every time I look through it, my hands get all nasty), it ended up being a pretty lucrative trip (it was also monumental for a secondary reason, but you'll have to wait a few days to hear about that one). For only $19.99, our living room seems to have a new lease on life, and feels refreshed for the coming Fall season... that is, if it ever decides to show up.